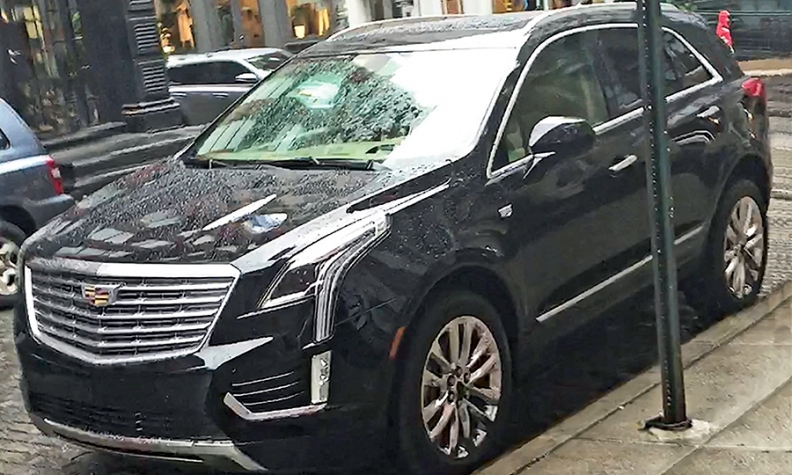 This spy photo of the Cadillac XT5 shows a side crease and a wider, deeper version of Cadillac's grille. DETROIT -- Cadillac's new XT5, the replacement for the SRX midsize crossover, keeps the SRX shape but gets a pronounced side crease that cuts above the door handles for a slightly higher beltline, new spy photographs show. The bolder front end is in keeping with Cadillac's recent cars, including the CT6 big sedan: a wider, deeper take on Cadillac's shield-shaped grille, flanked by the brand's signature vertical LED headlights. Spy shots purportedly taken during a photo shoot in Manhattan show an uncamouflaged XT5. The rear end has a higher tailgate and more pronounced, boomerang-shaped taillights. The XT5 appears to be similar in size to the two-row, five-seat SRX. It has some extra ground clearance, based on the photos. A Cadillac spokesman said that "this particular vehicle is one of our future cars, but we ask you to stay tuned for more information as we continue to test, photograph and more as we proceed toward launch." The SRX is Cadillac's top-selling U.S. nameplate, with sales of 30,207 vehicles through June -- up 4.7 percent from the year-ago period and just 4,172 vehicles shy of the brand's entire car lineup. The current-generation SRX went on sale in 2009 for the 2010 model year. The XT5 is expected to be unveiled this year, possibly in November at the Los Angeles Auto Show, with an on-sale date in the spring.